Make your Wedding Ceremony musically memorable. 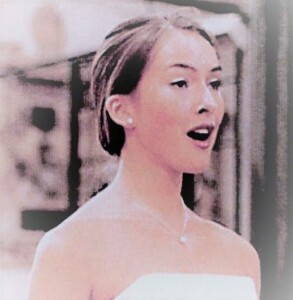 . .
How it works . .
For a civil ceremony Emma also provides up to 30 minutes of background singing to set the atmosphere as guests arrive and take their seats. 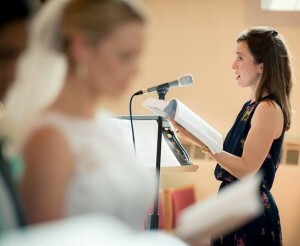 For a church ceremony she will also sing the congregational hymns to encourage your guests to sing along too. All songs are chosen by you from the repertoire (listed below) of pop, jazz, classical and hymns. * At a church wedding the Processional (entrance) and Recessional (exit) are traditionally organ instrumental but they can provide another opportunity to personalise your ceremony in addition to songs during the Signing of the Register. Alternatively you may wish to replace a congregational hymn with a solo (which could still be a hymn). At a Catholic wedding mass the Offertory and Holy Communion also provide opportunities for Emma to sing. Emma uses professional backing music played through her own compact state of the art PA system that can be assembled in venues and churches. If the ceremony is taking place in church then it’s preferable for the resident organist to accompany classical/sacred songs and hymns that can be played on the organ eg. Ave Maria to create optimal sound and atmosphere in the church setting. Emma does not usually supply backing music for congregational hymns as these should be played by the organist; but if the church doesn’t have an organist do let Emma know. Always discuss your song choices with the venue Registrar or church Minister because there can be restrictions, especially for civil ceremonies during which no religious songs are permitted and pop songs should be chosen sensitively for a church ceremony. Open to new song requests so please email Emma if you would like to discuss a certain song/s not listed; may incur an extra charge.